St. Paul speaks about freedom in the second reading and that is a word that is I am sure on a lot of your minds for at this crossroads of life, you are about to come into more freedom. You will have your own way space and your time to manage. You will be free of curfews and easily enforced rules. You are given more responsibility then you ever had before. And even as your smile grows in excitement at the prospect, so your parents eyes grow wider in concern. This is from the last chapter of the Book of Isaiah. It is written after the Exile when Jerusalem was being rebuilt. This book is in many ways a story of Jerusalem. At times Jerusalem has been a place of unspeakable sin and injustice (for example, 1:21-26; 3: 8-12; 5: 7). Yet, Jerusalem (Zion) also stands for the very center (the “mountain’ – the heights) of the Lord’s glorious sovereignty and rule (2:1-4; 24:23; 27:13; 52: 1-2; 60:14). Even though Jerusalem often fails to live up to the grace that the Lord showers on her, she is still the place the Lord has chosen for divine dwelling. The term ‘Kingdom of God’ that Jesus uses captures many of these aspects of the ideal Jerusalem. This passage uses images that earlier in the book have been used for destruction. The “overflowing torrent” had been the relentless army of Assyria which had ‘punished’ and defeated them (8:7-8; 28:2, 15, 18). Now it is a “torrent” of wealth and prosperity from God: shalom. Before, grass had been an image of what was impermanent and worthless (5:24; 15:6; 30:33; 40:8), but now the flourishing grass is an image of growth, health, and vitality for God’s people. When have you felt such comfort from God? In the first reading, God’s love was imaged as a mother’s love, a tender, nursing mother. But Paul shows us just how ‘tough’ a love this is. The cross of Christ reveals God’s undying bond of love with us. Because of this cross, Paul is utterly rooted in trust, the blessed assurance in a God who bears and nourishes us, who wants only our life and flourishing, who would die for love of us. If, with Paul, we truly believe this truth of God’s love, we will find peace and mercy. Paul bore the marks of Jesus on his body: he had scars from his sufferings for the gospel’s sake. But he had gained a peace that was beyond understanding – a peace that let him live a life ‘in Christ’ – in the freedom that last week’s reading had declared was for all who are in Christ Jesus. Paul ‘glories’ not in the circumcision or any other religious ritual: he glories in the cross. For it is at the cross that we can be transformed, recreated into children of God, trusting and knowing a love that is there to heal and give life, even in the midst of hardship and troubles. The marks of his apostolic sufferings are evidence of his faith in that love. With that faith, nothing can really bother Paul – or us if we learn to let such a faith grow in us. There is a balance between living a life detached and living life fully immersed in love. Detachment is approaching life freely. You are okay with however things work out. This is hard because we want our own way! And culture encourages decision-making or choosing sides. It is also hard because we love. We want things to work out well for those we love and we cling to what we achieve. But God is here to help us with this balance. This is why Paul says no one will make trouble for him again, because he bears the marks of Christ. It is through Christ that we receive consolation. Can you think of a time when you detached from something, trusted in the Lord and it worked out? Only Luke uses this story of Jesus sending out 72 (or 70) to go ‘ahead of him in pairs.” What do you make of this gospel story as Jesus continues his journey to Jerusalem? Do you think any of the appointed were women? In Jesus’ culture, goodness to a family member was considered ‘steadfast love.’ Hospitality was something given to strangers, usually by males. Travel was a very dangerous activity. Death was a constant threat once a person left their family village. Jesus is perhaps just uttering a cultural truism when he says that “I am sending you as lambs into the midst of wolves” – strangers among nonrelatives. Thus, hospitality was of vital importance in this culture. Jesus warns them to accept gratefully any hospitality that is offered, but to leave even the dust behind if they are rejected. They were not to be weighed down with disappointment. Remember also that the people at this time ‘saw’ demons everywhere. Today we might not personify evil in the same way. But evil is just as real. And, Jesus can still help us overcome it. When Jesus said to them, “I saw Satan fall like lightening from Heaven,” it is a difficult phrase to understand. It may mean that he saw evil being overcome by their proclaiming God’s kingdom. But it could also be a warning against pride. The legend was that it was pride that caused Satan to rebel against God; it was Satan’s pride that cast him out of heaven. Jesus may be telling them to be careful of the same pride and overconfidence. They had been given great power, but it was a gift. Our greatest glory is not what we can do, but what God has done for us – ‘our names written in heaven’ – sinners who are saved by God’s free gift of grace. Luke’s Jesus sends the disciples out in two’s. By doing so, Luke is telling us that the gospel happens between people – it doesn’t happen in your mind. It is through a sacrificial love – being in right relationship with at least with one other person (the only real ‘test’ of God’s Spirit being present). Only then do we begin to understand ‘salvation.’ Salvation is not antiseptic, unreal and sterile. “Person-to-person is the way the gospel was originally communicated. Person-in-love-with-person, person-respecting-person, person-forgiving-person, person-crying-with-person, person-hugging-person: that’s where the Spirit is so beautifully present . . . Restraint and passion – that is the paradoxical experience of the Holy.” We grow into our ability “to love another in a way that totally gives” ourselves and entrusts ourselves to another while respecting the other person and standing back in honor of them. Jesus is also trying to console them even as he is ‘toughening them up’ for the job. He warns them not to feel defeated when rejected. If they do not accept your peace, it will return to you. If they accept you, then let your presence as another Christ bring God’s goodness to them. There is an important theological concept that you many of you I am sure are aware of. It is called “Already, but not yet.” What it means is that we already have all we need to make the kingdom of God a reality. “Already” we have been redeemed and forgiven. We have been cherished and loved by a God who suffered and died for us. We have known ultimate love so there is nothing that stands in the way of our capability of making the kingdom of God alive in our midst. This Old Testament book was probably written by two, maybe even three, different anonymous authors, with this portion being written after the Babylonian exile. It is interesting that grace proceeds the mourning. How else are we to carry our burdens but through God’s grace? It is only through God’s grace that death and destruction do not have the final answer. In God there is hope. What better goodness to hear with all that is in the news lately? Paul says we are all children of God…co-heirs…not alone but one body in Christ. In fact, we are to “put on” Christ in our oneness. By linking us all back to Abraham, he is saying the Israelites are not the only chosen people of God. We are all chosen. How does it feel to know you are chosen by God? Paul was not concerned with hierarchical leadership as much as he was with the house churches acting “as a body”. Leaders were to admonish, but so was everyone. Prophets were to build up, but so was everyone. Paul’s notion of church leadership included the concepts of reciprocity, collegiality, and collaborative ministry. The one in charge would carry out the wishes as servant of the “body” (Birmingham, Word & Worship, p. 403). How is this reflected in our church today? The next 10 chapters of Luke are about Jesus’ journey to Jerusalem. They are particular to Luke. The other evangelists do not give such an exhaustive rendering of the journey. Luke intended to show that Jesus’ journey mirrors the journey of every Christian (Birmingham, W&W, p. 404). It gives us the picture that the disciples really were On The Way. There is continual movement for them…constantly busy…yet they are focused on Christ and are fed in the midst of it. Do you relate to this? Peter’s response that Jesus is the Messiah, the Christ of God, was a good answer, but one that hung Judaism’s old messianic hopes on Jesus. This messiah had been long anticipated as a royal descendant of the Davidic dynasty with might and prowess sufficient enough to restore the nation to the prestige and power it had known under David. Jesus had to correct this notion. His mission would not be spent in military maneuvers forcing foes into submission. He had come as one who serves, as one proclaiming God’s kingdom, a kingdom of love. This love would entail self-sacrifice – self-giving — dying to oneself. Only this way of life would lead to transformation, but first it would also lead to suffering. Jesus does not ‘sugar-coat’ this message. We as disciples – who claim to recognize God’s anointing presence in and with Jesus — must follow him: daily picking up our crosses, enduring rejection and suffering and even death so that we might find new life, resurrection. This dying and rising is a daily event, a daily decision, a daily response to our faith in Jesus. As William Barclay says, Jesus requires that life be spent, not hoarded. We cannot be concerned with what is the safe thing – the bare minimum – the me-first routine. We need to seek the right thing, the generous gift, the what-can-I-do-for-others endeavor. We need to be grace-driven, grace-filled rather than ambition-motivated and power-directed. How do you do this? How does being one body in Christ help us with this? Do you think that God keeps score? I want to get back to that question. But first, let’s get into this Gospel which I must admit is a little uncomfortable for me. It might be the public display of affection for Jesus or the woman’s outlandish and very physical encounter with Christ, anointing his feet and wiping his feet with her hair. All of that seems pretty discomforting especially given that it is being done to the Lord. Besides, if you were giving a dinner party, who would want that scene to break out? I have a friend in the hospital. 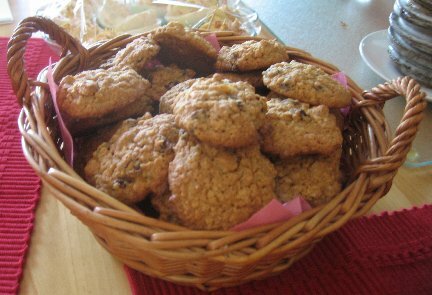 His favorite cookies are oatmeal raisin, so I’m baking him a batch. I write this as I wait for one pan to come out and another one to go in. I don’t even know if they allow cookies in the I.C.U., but I’m baking them anyway. I have to DO something. You know that feeling? When someone you care about is suffering and you just want to take it away but you can’t? So I bake cookies. This is my prayer for him. I mix the dough, I add the wrinkled raisins, and I pray to God that he finds healing. It is something my small self can do through God’s good grace. I’ve been feeling this a lot lately…an aching feeling to do something in situations where I really can’t do much of anything. Sometimes it is small things, like not getting anything to grow in my vegetable garden. Sometimes it is big things, like Pulse in Orlando. People say we can at least pray, as if that’s at the bottom of the “What To Do in a Crisis” list. Isn’t it the most we can do? Maybe we dismiss prayer because it’s so easy. It’s just a conversation with God. It doesn’t feel like enough. Maybe we dismiss it because it’s hard to see the fruits of it sometimes. Answers don’t come readily, or in the way we wish they would. Maybe prayer can feel one-sided. We talk, we wait, we wonder. Is God really out there? But I think God puts the ache there to begin with. God starts the conversation before we even fold our hands together in prayer. God calls to us…come, please, come. God calls to us to be with God. And it is because of God’s good grace that we go to prayer. It’s why I’m making cookies. I don’t think I came up with the idea on my own. God put the “I-need-to-DO-something” feeling on my heart and I just went along with it. How else do we weather storms but to go to God in prayer? Jesus said it is the only way. Even if things don’t get better, there is healing…there is solace…there is comfort…there is company. Prayer DOES make things better when we look at it that way. And so the last batch is now in the oven. The prayer for my friend draws to a close. My son runs up to the counter to be a taste-tester, and he pronounces the cookies good. To me, they are good in more ways than taste. God made them a prayer by God’s good grace. It says in Psalm 63 that we will hear this Sunday, “My soul is thirsting for you, O Lord my God.” That is the aching feeling God puts in us. So let’s go to God in prayer and answer that thirst. It is the most we can do, whether it is a friend in the hospital, an empty garden or a terrorist attack. Just let God in, and pray. This is a story of forgiveness, which is what all of the readings seem to be about today. David owned up to his sin. By Israel’s law David could have been put to death for his actions, but he was spared. Justice would be realized through David’s offspring (there was a Jewish understanding that offspring would bear the guilt of their parents). David would be judged and his act of violence would be reciprocated. David’s child by Bathsheba would die. Other children of David would later die by the sword as well (Birmingham, M. Word & Worship for Year C, p. 396-397). Is it enough to say you’re sorry? How often do we see in the news the excuses people make for bad behavior instead of owning up to what they did? There is something about being sorry and making amends. Putting action to the words. There is a reason why a penance is given with absolution for our sin. We must go forth. It is not enough to sit with our sorry. We must be changed by making our whole body go do something about it. How have you seen this in your own life? The epistle to the Galatians is known as Paul’s “angry letter”. These people have aroused his ire in a manner that surpasses anything we find elsewhere. The main issue is that they want to be circumcised! Paul feels by them wanting this that they are deserting God and perverting the gospel of Christ. Is one made right with God by doing works of the law (like circumcision) or by trusting in Christ? (Powell, M., introducing the New Testament, p. 307-308) It’s not that Paul has no use for law; he is only giving perspective. Don’t let it own you. The game changer is Jesus. Follow Him. Paul’s spirituality is profoundly changed when he met the risen Christ. He reflects on Jesus’ teachings in such a way that he LIVES them. Then he shares that experience with us. He feels such a personal relationship with Jesus that he says Christ lives IN him. Isn’t that profound? Where else do we hear about such a connection in scripture? The apostles were too close to Jesus. They were friends. They couldn’t make that leap yet that Jesus could be incarnated through them. But Paul sees this reality. It is a risk for Paul, right? He is saying it is SO MUCH MORE than about law. It is about BEING. Think of examples in your own life when the ordinary stuff of life (that you thought was important) came at odds with what you believe to be true in your center (where God is). *When a guest entered such a house, three ‘signs of respect’ were always done: a kiss of peace, a washing of feet, and an offering of a drop of rose attar or a pinch of incense. These things were considered just good manners. *Why would Simon invite Jesus to his house? He was an admirer of Jesus. Not every Pharisee was an enemy. This seems unlikely because of the disagreement. He could be trying to entice Jesus into saying or doing something that he can charge against him. This also seems unlikely because in verse 40, Simon calls him Rabbi. He may have enjoyed celebrities. This would best explain the wavering respect. *Simon was conscious of no need; the woman was consumed by her need. In Jesus she found her need answered; she had been lost and now she was found. She was overwhelmed with love – and with being loved and accepted. She is not afraid to even unbind her hair (act of gravest modesty) and to cry tears of joy. The one thing that can shut us off from God is self-sufficiency . . . It is true to say that the greatest sin is perhaps to be conscious of no sin. Our need can bring us to open the door of our hearts to God’s forgiveness and love. God is love and love’s greatest glory is to be needed. This story is about contrast – the contrast between self-righteousness and true righteousness, which is a loving response to God’s love for us. This woman’s loving deeds are not done to ‘earn’ forgiveness; they are an overwhelming response to first having been forgiven. The forgiveness came before the love. The last short section of this gospel from chapter 8 may allow us to confuse ‘this sinful woman’ with Mary of Magdala. They are most likely not the same person. Mary Magdalene’s ‘seven devils’ might have been a very serious illness from which Christ cured her. There is no evidence that this referred to sexual sins. It is the smallness of our hearts that reduces people to caricatures; this smallness shuts out others. The love Jesus offers opens our hearts to a whole new world of goodness and possibilities! Elijah had fled to Zarephath of Sidon for refuge from the wrathful king of Israel and was staying at the house of a widow when her son died. She is obviously devastated by the loss and she wonders how it could have happened under the same roof of the so called prophet of God. Elijah himself seems shaken and blames God. “O LORD, my God, will you afflict even the widow with whom I am staying by killing her son?” He lays his body over the son’s body and prays three times until the “life breath” returns to the child’s body. At Christmas we celebrate the birth of Jesus Christ, the Son of God and the Word Made Flesh. At Easter we celebrated his resurrection and 40 days later his Ascension into heaven. And last week, we celebrated the great feast of the Holy Spirit, Pentecost. When do we ever celebrate God the Father, the first person of the Trinity? Well, we have today. Or at least one third of today, the Feast of the Holy Trinity. Where is the love for Father, the begotter of the only begotten son of God and the processor from whom the Spirit proceeds? Today, I want to celebrate the first person of the Trinity.